The New School students occupy cafeteria for workers | Fight Back! New York, NY - On May 6, a group of activists from various organizations followed up their celebration of Karl Marx’s birthday by meeting up with students at The New School to show their solidarity with the cafeteria occupation and the food service workers. 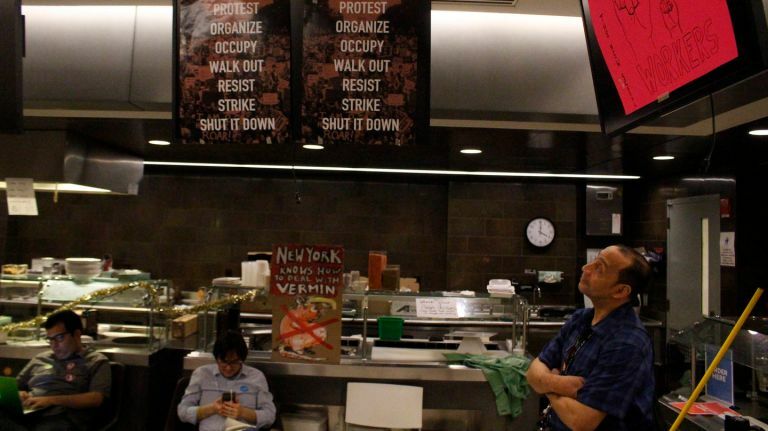 A group of students at The New School in New York City have occupied the cafeteria in solidarity with 45 food service workers, who received notice that they would be laid off by Steve Stabile, vice president of finance and business. The occupation began on May 1, in honor of International Workers Day. The workers were told that they could be re-hired, but that they would not receive the protection of their union if they were. This would result in them losing all of their benefits, including health care, and includes workers who have been there for over 16 years. The head chef has also come under fire due to accusations of sexual harassment, and for being transferred from a previous position for such behavior. The list of demands are 1) every job saved, 2) higher wages, 3) same benefits, 4) tuition vouchers, 5) resignation of Steve Stabile and 6) worker-student control of the cafeteria. The action was organized initially by the Communist Student Group, and has since broadened to a coalition of various radical student groups.